We seek membership and donations to help the rural children and unemployed youth to under go training in our computer centres and tailoring centre in Doddamudavadi and surrounding villages. There is severe shortage of power to back the computer systems. This is a major handicap we are facing. UPS and batteries are costlier than computers!. We require continous flow of funds to maintain teachers at each one of our centres and also for opening new centres. 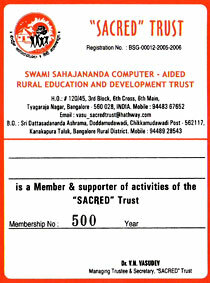 We shall be greatful if you would become a ‘Member of the SACRED Trust’ by donating a minimum of Rs. 365/- as the annual Membership fee or by donating a computer, even if it is a second hand one, or a sewing machine or Educational CD’s / DVD’s or books for the Trust’s library. They will all be utilized for training more and more students from our villages and helping the youth develop skills to get appropriate jobs and also to modernise primary and secondary school education in rural areas. Annual report highlighting the progress made by the Trust will be sent to all Members via e-mail. We are sure you will derive great spiritual pleasure when you become part of this service of the SACRED Trust. We seek your Feedback for improving or diversifying the activities of the Trust. We have received tax exemption from the Income Tax Department. Donations made to the TRUST will make you eligible for tax exemption. The Trust will send You a printed receipt mentioning the tax exemption details. Tyagaraja Nagar, Bangalore - 560 028.